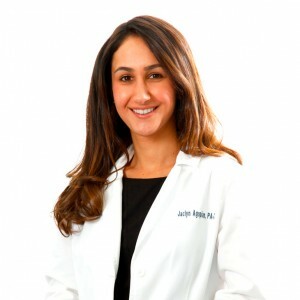 Jaclyn Agopian, MPAP, PA-C is a board certified Physician Assistant specializing in general and cosmetic dermatology as well as laser medicine. She received her Master of Physician Assistant Practice degree from The Keck School of Medicine at the University of Southern California. As an expert in skin care, Jaclyn performs comprehensive adult and pediatric medical dermatology services. Jaclyn also excels in cosmetic dermatology and is committed to helping her patients maintain their youthful appearance. She is skilled in all advanced laser treatments as well as chemical peels and cosmetic injections. Jaclyn is a Fellow of the American Academy of Physician Assistants and of the Society of Dermatology Physician Assistants.